Marinated and pan roasted chicken is the star in this Fajita Salad with Pan Roasted Chicken. I LOVE taco salads. I could eat taco salad every week. Yes, I hear you, “This isn’t taco salad.” I know. It’s the next best thing! Fajita Salad with Pan Roasted Chicken!! Because what’s better than tacos? FAJITAS! You’ll see, I’m on a fajita kick. And why not? They’re quick and tasty for a weeknight meal. And to make them a salad? HEALTHY! WITH THE MARINADE! Crazy! I KNOW! Then, on the day I made the salad, I crisped up some corn tortilla strips in the oven for some nice crunch, roasted the onions and peppers, pan roasted the chicken, assembled the salad, sliced the chicken, and placed it on top. YUM! Grab a fork, it’s that good. And yes, there’s that Fiesta Ranch stuff again. Honestly, I’d drink it like milk if I could get away with it. It is my new favorite dressing that I want to pour over everything. Roasting the vegetables gives it that fajita feel in this salad. They’re usually broiled or grilled with the meat and served together. I wanted that crisp tender taste you get when you order fajitas out, including the tomatoes. I LOVE the broiled/grilled tomato in fajitas. It gets that caramelized layer with the tender sweet flesh. Is it dinner time yet? Cause I’m getting HUNGRY! Place the chicken in a zip top plastic bag. Combine the next six ingredients (lime juice through garlic powder) in a small bowl. Pour into the zip top bag with the chicken and marinate 10 to 30 minutes. Heat a large skillet coated with cooking spray over medium-high heat. Cook the chicken 7 minutes, turn and then cook 5 to 8 minutes more until the chicken is cooked through and no longer pink in the middle. While the chicken is cooking, preheat the oven to 400. Cut the tortillas into thin strips and place on a baking sheet covered with aluminum foil and coated with cooking spray. Bake at 400 for 5 minutes, stir, and then an additional 5 to 10 minutes or until the tortillas are crispy. Remove from heat and set aside. Place the peppers, onions and tomatoes on a baking sheeting covered with aluminum foil coated with cooking spray. Roast in a 400 oven for 5 to 10 minutes or until the vegetables are slightly tender. Remove from heat and allow to cool. To make the dressing, combine 1/4 cup lime juice, 1/2 cup Greek yogurt, 1/2 cup buttermilk, 1 tablespoon ground cumin, and one package Fiesta Ranch Dip Mix. Using a whisk, stir well to combine and set aside. Place 1 1/2 cups lettuce on each of four plates. Top with bell peppers, onions, cherry tomatoes, cheese, and tortillas strips. 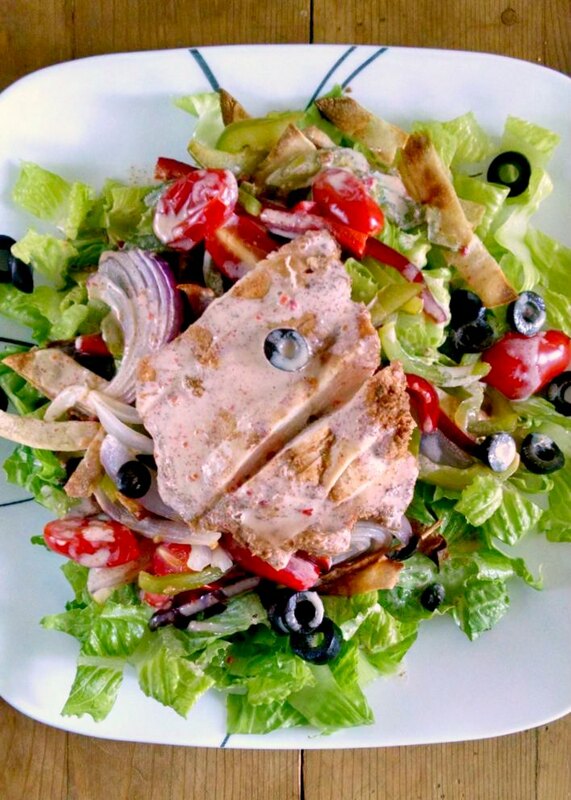 Thinly slice the chicken breasts, and place 4 ounces of chicken on each salad. Drizzle with salad dressing and serve. this looks delicious! yum. Hugs! I love taco salads and pan-fried chicken too and your post reminds me that it has been too long since I have made it in our kitchen! Well, what are you waiting for? LOL Thanks for dropping by and commenting.